Russian president jokes that Crimea is the 'only' place Jews could have financial difficulties. Russian President Vladimir Putin made a joke invoking the anti-Semitic trope about Jews and money during a visit to Crimea. During a visit with local residents and religious leaders on Monday in Crimea, a local Jewish leader made a comment about financial difficulties. Putin replied “So the Jews have problems with finances! Only such a thing could happen in Crimea.” He also said to the bearded ad black-hatted Jewish man in Hebrew “todah rabah,” or thank you very much. The exchange was first reported in English in a tweet by Washington Post Moscow correspondent Anie Ferris-Rotman, who included a video of the exchange. 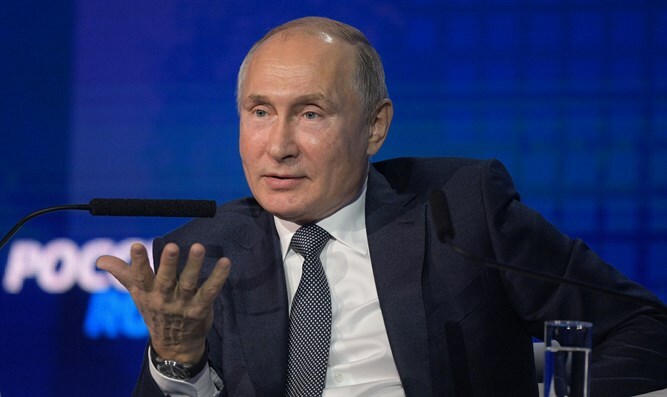 Also on Monday in Crimea, Putin proposed inviting Israeli Prime Minister Binyamin Netanyahu to the opening of a synagogue in Sevastopol, after offering to invite Turkish President Recep Tayyip Erdogan to the opening of a Crimean Mosque. He also stated that the Jewish community of Russia was making a large contribution to the country’s development. “I hope that Jews in Crimea will play the same positive role. Judaism is also among our traditional denominations, traditional religions, and I am very pleased that religious life is developing here, in Crimea,” the president said.